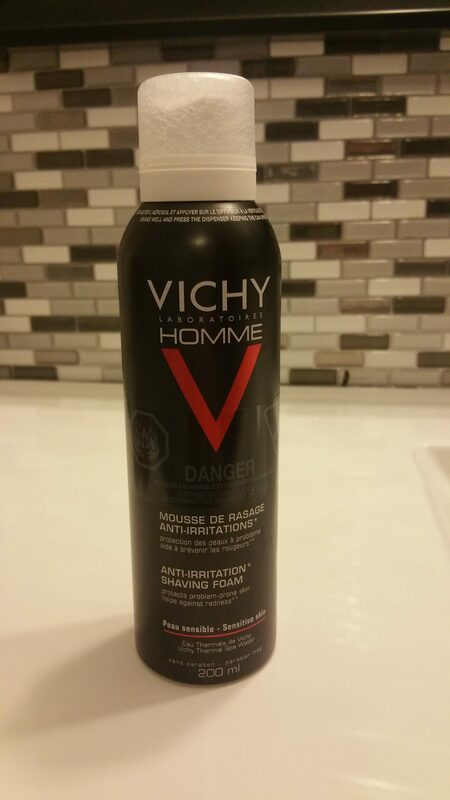 The Vichy shaving foam is somewhat more expensive than your typical foam can, at $13 on sale at your local pharmacy. That being said, I was quite curious to see what $13 was buying you. It is also a fairly smaller can when compared to most other brands. So we are now on the shaving stage and I press the valve…first the mouth of the valve is rectangular and produces a nice wide foam. Cool. The said foam is seriously thick and rich. In fact more so than anything I expected or have used when shaving. It was almost as thick as “Cool Whip”. It went on so well that I felt like my skin was completely protected. When starting to shave, it felt like the blade was well lubed and I ended up with one of my best shaves. So $13 does buy you something better. In fact, much better. I highly recommend this product. Hopefully you can find it on sale. Familiprix in Quebec holds it.